Activated carbon is a good adsorbent. Adsorption, not to be confused with absorption, is a process by which a gas, liquid, or solute (substance in solution) binds to the surface of a solid or liquid (called the adsorbent), forming a film of molecules or atoms (called the adsorbate). It differs from absorption, a process by which a substance diffuses into (or permeates) the solid or liquid absorbing medium. The term sorption encompasses both processes, and desorption is the reverse of either of the two processes. Adsorption has been found to occur in many natural physical, biological, and chemical systems. It is widely used in laboratory research, industrial applications, and water purification systems. For example, activated carbon, the most common adsorbent, is used for the adsorption of organic substances and nonpolar adsorbates, and for waste gas and wastewater treatment. Silica gel is used for drying gases and adsorption of heavy (polar) hydrocarbons from natural gas. Zeolites are useful for the drying of process air, carbon dioxide removal from natural gas, carbon monoxide removal from reforming gas, air separation, catalytic cracking, and catalytic synthesis and reforming. In addition, finely divided platinum and palladium are good adsorbents of certain gases and serve as catalysts in chemical reactions. Adsorption is a consequence of attractive interactions between the surface of the adsorbent and the species being adsorbed. In the bulk of an adsorbent, all the bonding requirements (be they ionic, covalent, or metallic) of the constituent atoms of the material are fulfilled by other atoms in the material. However, atoms on the surface of the adsorbent are not wholly surrounded by other adsorbent atoms and therefore can attract molecules of the adsorbate. The exact nature of the bonding depends on details of the species involved. The adsorption process is generally classified as either physisorption (physical adsorption) or chemisorption (chemical adsorption). Weak interactions, characteristic of weak van der Waals forces, lead to physisorption; strong interactions, characteristic of covalent bonding, lead to chemisorption. In the former case, adsorbed molecules remain unbroken; in the latter case, the adsorbed molecules may or may not be broken up. The degree of adsorption is influenced by certain properties of the adsorbent and adsorbate, and conditions such as temperature and pressure. Generally, adsorption is enhanced at low temperatures and high pressures. In addition, it is favored by larger surface areas of the adsorbent and by greater attractive forces between the adsorbent's surface and the adsorbate. Adsorption, ion exchange, and chromatography are sorption processes in which certain adsorbates are selectively transferred from the fluid phase to the surface of insoluble, rigid particles suspended in a vessel or packed in a column. Adsorbents are used usually in the form of spherical pellets, rods, moldings, or monoliths with hydrodynamic diameters between 0.5 and 10 millimeters (mm). For repetitive use at high temperatures, they need to have high abrasion resistance and high thermal stability. In addition, small pore diameters lead to higher exposed surface area and hence higher capacity for adsorption. Adsorbents must also have a distinct pore structure that enables rapid transport of vapors. Most industrial adsorbents fall into one of three classes, as noted below. In addition, some metals such as platinum and palladium (in finely divided form) are good adsorbents of certain gases and serve as catalysts in chemical reactions. Silica gel is a chemically inert, nontoxic, polar, and dimensionally stable (below 400°C) amorphous form of SiO2. It is prepared by the reaction between sodium silicate and sulfuric acid, which is followed by a series of after-treatment processes such as aging, pickling, and so on. These after treatment methods results in various pore size distributions. Silica is used for the drying of gases (such as process air, oxygen, and natural gas) and adsorption of heavy (polar) hydrocarbons from natural gas. Zeolites are natural or synthetic crystalline aluminosilicates that have a repeating pore network and release water at high temperatures. These zeolites are generally polar by nature. They are manufactured by hydrothermal synthesis of sodium aluminosilicate or other silica source in an autoclave, followed by ion exchange with certain cations (Na+, Li+, Ca2+, K+, NH4+). The channel diameter of zeolite cages usually ranges from 2 to 9 angstrom (Å) (200 to 900 picometers (pm)). The ion exchange process is followed by drying of the crystals, which can be pelletized with a binder to form macroporous pellets. Zeolites are applied in the drying of process air, CO2 removal from natural gas, CO removal from reforming gas, air separation, catalytic cracking, and catalytic synthesis and reforming. Nonpolar (siliceous) zeolites can be synthesized from aluminum-free silica sources or by dealumination of aluminum-containing zeolites. The dealumination process is done by treating the zeolite with steam at elevated temperatures, typically above 500°C (1000°F). This heat treatment breaks the aluminum-oxygen bonds and the aluminum atoms are expelled from the zeolite framework. 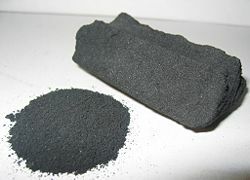 Activated carbon is the most widely used adsorbent. It is a highly porous, amorphous solid consisting of microcrystallites with a graphite lattice, usually prepared in small pellets or a powder. It is nonpolar and cheap. However, one of its main drawbacks is that it is combustible. 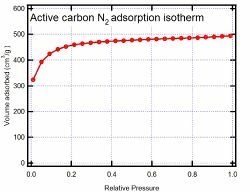 This isotherm shows the adsorption of nitrogen on activated carbon at different pressures. The graph shows a marked microporous type I behavior. Activated carbon can be manufactured from carbonaceous material, including coal (bituminous, sub-bituminous, and lignite), peat, wood, or nutshells (including coconut). The manufacturing process consists of two phases, carbonization and activation. The carbonization process includes drying and then heating to separate by-products, including tars and other hydrocarbons, from the raw material, as well as to drive off any gases generated. The carbonization process is completed by heating the material at 400–600°C in an oxygen-deficient atmosphere that cannot support combustion. The carbonized particles are “activated” by exposing them to an oxidizing agent, usually steam or carbon dioxide at high temperature. This agent burns off the pore-blocking structures created during the carbonization phase, and so they develop a porous, three-dimensional graphite lattice structure. The size of the pores developed during activation is a function of the time that they spend in this stage. Longer exposure times result in larger pore sizes. The most popular aqueous phase carbons are bituminous based because of their hardness, abrasion resistance, pore size distribution, and low cost, but their effectiveness needs to be tested in each application to determine the optimal product. Activated carbon is used for adsorption of organic substances and nonpolar adsorbates, and it is also usually used for waste gas and wastewater treatment. Its usefulness derives mainly from its large micropore and mesopore volumes and the resultant high surface area. Platinum and palladium, especially in finely divided form, are great adsorbents of hydrogen and other gases. They therefore serve as excellent catalysts of various chemical reactions. For example, platinum-supported catalysts are used in the refining of crude oil, reforming, and other processes for producing high-octane gasoline and aromatic compounds for the petrochemical industry. Also, the chemical industry uses platinum or a platinum-rhodium alloy to catalyze the partial oxidation of ammonia to yield nitric oxide—the raw material for fertilizers, explosives, and nitric acid. At room temperature and atmospheric pressure, palladium can adsorb up to 900 times its own volume of hydrogen. Thus, palladium can be used to store substantial quantities of hydrogen safely. Finely divided palladium is a good catalyst for reactions such as hydrogenation (addition of hydrogen atoms), dehydrogenation (removal of hydrogen atoms), and petroleum cracking (breaking of large, complex hydrocarbons to smaller, simpler ones). Since 1979, the automotive industry has been using palladium, platinum, and rhodium as catalysts in catalytic converters to treat automobile exhaust emissions. Portal site mediated adsorption is a model for site-selective activated gas adsorption in metallic catalytic systems that contain a variety of adsorption sites. In such systems, low-coordination "edge and corner" defect-like sites can exhibit significantly lower adsorption enthalpies than high-coordination (basal plane) sites. As a result, these sites can serve as "portals" for very rapid adsorption on the rest of the surface. The phenomena relies on the common "spillover" effect, where certain adsorbed species exhibit high mobility on some surfaces. This model explains seemingly inconsistent observations of gas adsorption thermodynamics and kinetics in catalytic systems where surfaces can exist in a range of coordination structures, and it has been successfully applied to bimetallic catalytic systems where synergistic activity is observed. The original model was developed by T.S. King and coworkers to describe hydrogen adsorption on silica-supported silver-ruthenium and copper-ruthenium bimetallic catalysts. The same group applied the model to carbon monoxide (CO) hydrogenation (Fischer-Tropsch synthesis). C. Zupanc and coworkers subsequently confirmed the same model on magnesia-supported cesium-ruthenium bimetallic catalysts. When a virus infects a cell, the first step is adsorption of the viral particle (virion) on the cell surface (membrane). After that, the viral genetic material (nucleic acid) becomes uncoated as it penetrates the cell. The viral nucleic acid, which may or may not become integrated into the cell genome, then directs the synthesis of viral nucleic acids and proteins, followed by assembly of new viral particles, and release of the particles. Adsorption may be described quantitatively by the use of isotherms. An isotherm shows the amount of adsorbate on the adsorbent as a function of its pressure (if gas) or concentration (if liquid) at constant temperature. The quantity of material adsorbed is nearly always normalized by the mass of the adsorbent to allow comparison of different materials. where is the quantity adsorbed, is the mass of the adsorbent, is the pressure of adsorbate and and are empirical constants for each adsorbent-adsorbate pair at a given temperature. The function has an asymptotic maximum as pressure increases without bound. As the temperature increases, the constants and change to reflect the empirical observation that the quantity adsorbed rises more slowly with increasing pressure, and higher pressures are required to saturate the surface. These four assumptions are seldom all valid. In particular, the surface always has imperfections, adsorbed molecules are not necessarily inert, and the adsorption mechanism for the first molecules adsorbed is clearly not the same as that for the last ones adsorbed. The fourth condition is the most troublesome, as frequently more molecules will adsorb on the monolayer; this problem is addressed by the BET isotherm for relatively flat, (non-microporous) surfaces, noted below. The Langmuir isotherm is nonetheless the first choice for most models of adsorption, and has many applications in surface kinetics (usually called Langmuir-Hinshelwood kinetics) and thermodynamics. Where is the partial pressure (for gases) or the molar concentration of the solution (for liquids). Through its slope and y-intercept, one can obtain vmon and K, which are constants for each adsorbent/adsorbate pair at a given temperature. vmon is related to the number of adsorption sites through the ideal gas law. If one assumes that the number of sites is just the whole area of the solid divided into the cross section of the adsorbate molecules, one can easily calculate the surface area of the adsorbent. The surface area of an adsorbent depends on its structure; the more pores it has, the greater the area, which has a big influence on reactions on surfaces. Langmuir isotherm (red) and BET isotherm (green). x is the pressure divided by the vapor pressure for the adsorbate at that temperature (usually denoted ), v is the STP volume of adsorbed adsorbate, vmon is the STP volume of the amount of adsorbate required to form a monolayer, and c is the equilibrium constant K used in the Langmuir isotherm multiplied by the vapor pressure of the adsorbate. The key assumption used in deriving the BET equation is that the successive heats of adsorption for all layers except the first are equal to the heat of condensation of the adsorbate. The Langmuir isotherm is usually better for chemisorption and the BET isotherm works better for physisorption for non-microporous surfaces. ↑ R.L. Narayan and T.S. King, Hydrogen adsorption states on silica-supported Ru-Ag and Ru-Cu bimetallic catalysts investigated via microcalorimetry, Thermochimica Acta 312(1-2) (1998): 105-114. ↑ D.P. VanderWiel, M. Pruski, and T.S. King, A Kinetic Study of the Adsorption and Reaction of Hydrogen on Silica-Supported Ruthenium and Silver-Ruthenium Bimetallic Catalysts during the Hydrogenation of Carbon Monoxide, Journal of Catalysis 188(1) (1998): 186-202. ↑ C. Zupanc, A. Hornung, O. Hinrichsen, and M. Muhler, The Interaction of Hydrogen with Ru/MgO Catalysts, Journal of Catalysis 209 (2002):501-514. Bruch, L.W., Milton W. Cole, and Eugene Zaremba. Physical Adsorption: Forces and Phenomena. Mineola, NY: Dover Publications, 2007. ISBN 978-0486457673. Rouquerol, F., J. Rouquerol, and K. Sing. Adsorption by Powders and Porous Solids: Principles, Methodology, and Applications. San Diego: Academic Press, 1999. ISBN 0125989202. Yang, R.T. Adsorbents: Fundamentals and Applications. Hoboken, NJ: Wiley-Interscience, 2003. ISBN 0471297410. Derivation of Langmuir and BET isotherms. This page was last modified on 30 August 2018, at 19:52.